Dale and Linda Marshall . . .
. . . under the African sun. You may send a free fax to Dale Marshall at 011-263-167-23044. His E-Mail address is: dale@earth.co.zw. It was 1961 when Linda and I became keenly interested in the Lord's work in what is today Zimbabwe. We followed the work of the Ziden Nutt family as they prepared to serve in Zimbabwe. On their first furlough they encouraged us to become part of the work of the Lord in Zimbabwe and we answered that call in 1965 and arrived on the field in June 1966. Our roots in African soil have grown deep and strong. We came to Africa with three children. Heidi was six, Brenda was five and Steven turned two just after our arrival in Cape Town. Lindale was born in Zimbabwe in January 1974. At this time, three of our children and their families are in Zimbabwe. Brenda and her husband Mike Hanson and their two children, Damien and Christelle are in France establishing New Testament churches. Heidi is married to Roy Frayne They have two children, Jason and Janelle, and they live 15 miles south of us at Banket where Roy is the depot manager for the Grain Marketing Board. Steven and his wife Lorraine live in Harare where Steven is involved in a business venture, they have one child, Sloane. 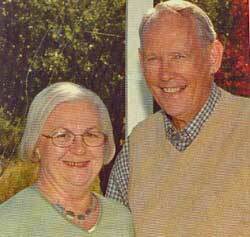 Lindale and her husband Nick Adams returned in 1995 to Zimbabwe to join us in the work. In 1966, I can remember when we discovered Mark 10:29-31, and God has kept that promise. God has rewarded us many times over that which we left behind to serve him in Africa. At this point in time it seems that Africa will be our final dwelling place on earth. The number of churches has risen to 121 at the time this is being written. The membership of these churches is in excess of 7,340. This past year, more new churches have been started than in any of the 30 previous years we have been in Zimbabwe. Some of these started with more men than women. Most churches in Zimbabwe have many more women than men. One of them came into being as a result of a baptismal service where 42 people were baptized and people from the area watching this said in essence, "What hinders us from being baptized?" An innovation of 1995 was the introduction of portable baptisteries. They have made it possible for people to be baptized where it was previously almost impossible, especially in the drought conditions we have been having over the past several years. There are now more churches with more members and we have reason to believe that many of these churches are growing spiritually as well as numerically. In the past year roofs were put on two buildings that were made roof- ready by the congregation itself. At Copper Queen another building is ready for a roof. We have an agreement that if the church will build the building to roof level, we will put a roof on it as funds are available to do so. AIDS is one of Zimbabwe's major problems. Recently, the government estimated that 25% of Zimbabwe's sexually active population is HIV positive. High risk groups that have been tested have proven to be more than 80% HIV positive. For some time now, it has been said that by the year 2000, 50% of all those in Zimbabwe between the ages of 20 and 40 will have died of AIDS. Of necessity, a new practice has developed in many of our congregations. At the end of the service, people who are sick are invited to come forward for prayers. The leaders of the church will lay on hands and each leader will pray for each sick person. It takes time, but for many they realize it is their only hope of getting well again. Many people with AIDS have become Christians. What other good option is there for dying people? At Chidamoyo Hospital, nurse Kathy McCarty has developed an AIDS home visitation program that has gained world wide attention. They go into a village and violate almost every cultural practice that relates to sexual behavior and death. Everyone in the village is asked to come and they all sit down and have a very serious talk about the fact that one of their members is going to die soon, others will probably follow soon after. These are things that African people never talk about. The result has been that many of the men who have become church leaders are men who are HIV positive and know they will soon die. Dying people get real serious about life. Fear God and keep his commandments, for this is the whole duty of man. We have made a commitment to take what we have and do the best we can with it. We are not perfect and for the most part we do not feel very qualified for what we are doing, but we are going to keep trying, and with God's help, some things of eternal consequence are going to be done.